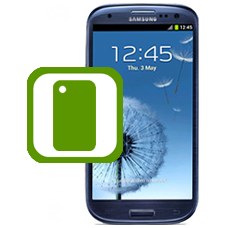 If your Galaxy SIII is looking a bit worse for wear and has scratches or marks along the rear metal case, then why not treat yourself to a brand new, sleek rear cover. Our expert technicians will replace your old, battered Galaxy S3 rear case with a stylish one. This is an in-house Samsung Galaxy S3 repair service, when ordering this service you are required to ship the Smartphone into our repair centre for works to be undertaken.